Oh, Please, No. MY Childhood Relived?! Oh sure. 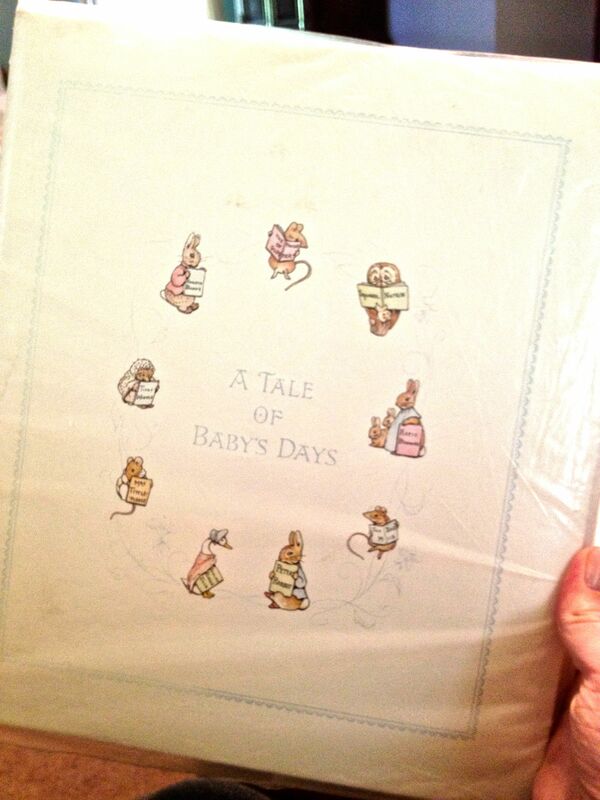 This looks like a precious baby book to YOU. But what’s inside would make Stephen King cry. Oh yeah. It’s all fine and dandy in the beginning. 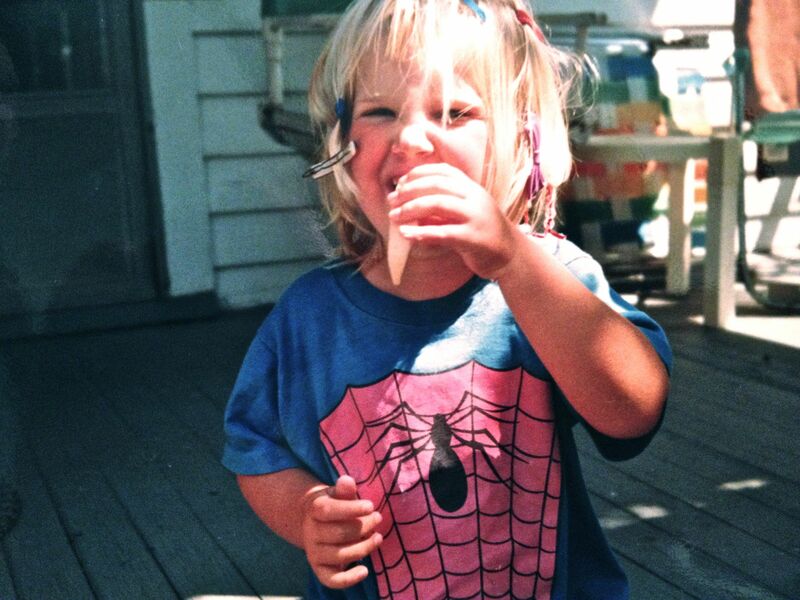 …but there’s a dark side to my childhood. I’m lulling you into a false sense of security with my sparse ‘cute’ pictures. 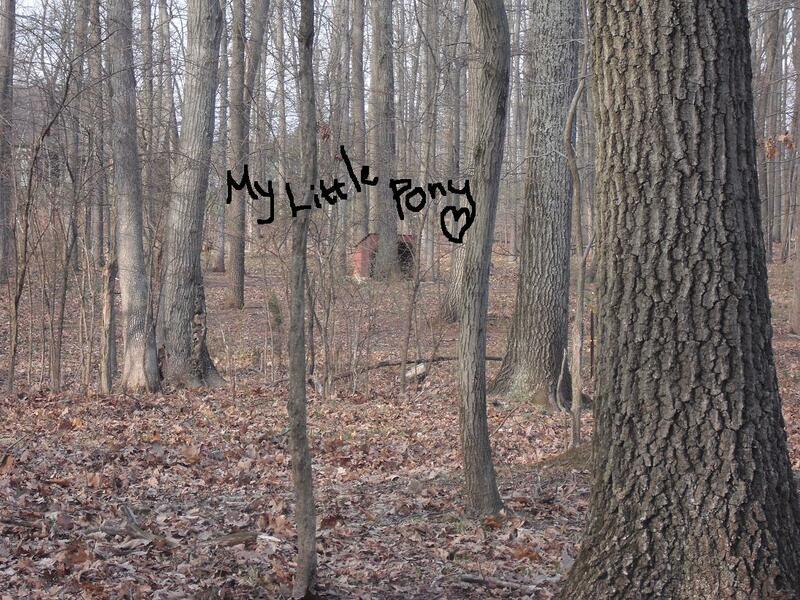 I’m revealing the horror thanks to an exceptional blog called Childhood Relived. At Childhood Relived, Angie Z. focuses on growing up in the 80s, which I think we can all agree is inherently funny. But her quick-wit and memory to match make this blog a non-stop Giggle Fest. I can tell you from corresponding with Angie via email that she is an extremely talented writer, both in and outside of the blogosphere. Angie has an ongoing Dynomite! 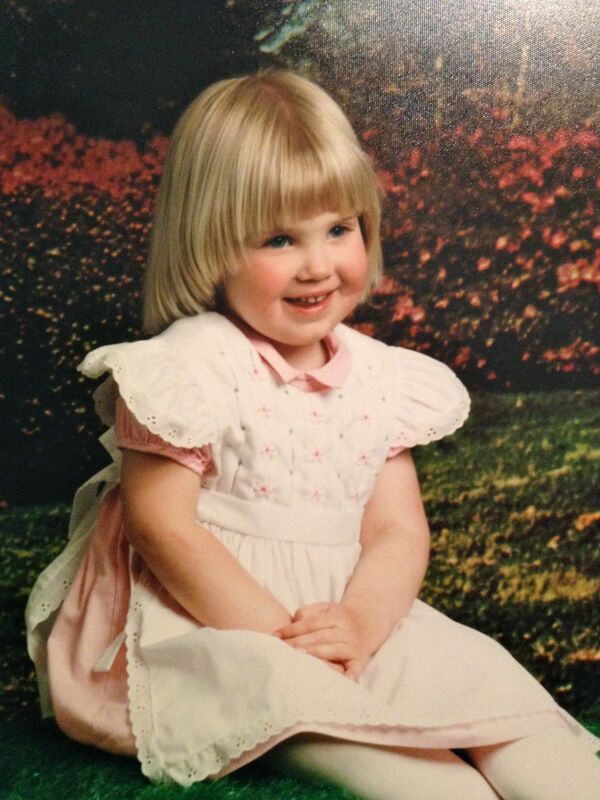 contest in which readers submit their most embarrassing childhood pictures. I don’t know what possessed me to enter. 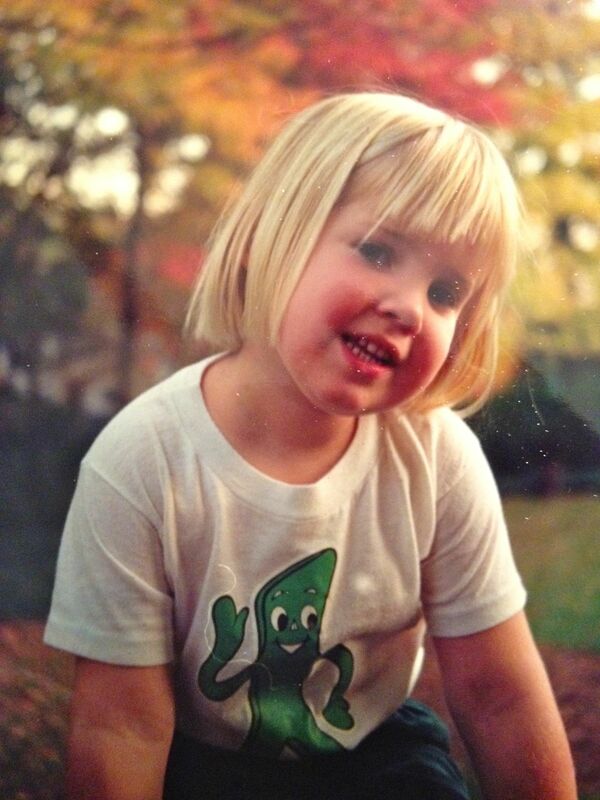 I wish that t-shirt still fit. Somehow turned into, well, click here to find out. There is definitely something in the air today. Fridays usually bring out a certain level of giddiness, it’s true, but today takes the [ooey, gooey, chocolate-filled, cream cheese icing-topped, chipmunk-decorated] cake. Not only was I positively thrilled to see (literally, see!) three of my favorite bloggers, Darla from She’s a Maineiac, Deb from The Monster in Your Closet and Renée from Lessons From Teachers and Twits, participate in GOGP’s first video blogging contest, but some of my other favorite bloggers also seem to have caught their own case of the sillies in the past 24 hours. Love it! <–Understatement of the year. P.S. – Why, yes, yes I did actually shake my sillies out before posting this. So enthusiastically that I forgot I let the dog out (…crud, don’t tell Peppermeister). For me, I think it all started with one of my very first best friends, a sporty, feisty girl I met in nursery school at the local YMCA. Everything was funny to her – even getting in trouble. We used to play a made-up game where we’d blindfold each other and then feed the blindfolded person something and make them guess what it was. She will never let me live down the time I gave her a spoonful of bacon grease from the coffee can my dad used to pour it into. I could barely hold the spoon still; suppressed laughter had me shaking from head to toe. Usually I have at least one episode whenever I’m with Babs. It’s kind of like the guarantee you get when you go to Friendly’s – service with a smile, or the meal’s on them. There are a thousand of these times I can’t remember, but they often start with me teasing Babs while we’re out shopping. I do so with a loving heart, to make sure she never starts wearing mom jeans or those puff-painted sweatshirts (again). Department store dressing rooms are like an altar where I give thanks to the giggle gods by trying on hideous things and transforming into the person who would wear them. Retired, chain-smoking Floridian? Snooki’s second cousin (the one no one likes to talk about)? Stripper trying to cover her dark past and pay her way through college? Been there, donned that. The Good Greatsby‘s post about children’s birthday parties inspired me to write this latest post about my favorite possession, my monogrammed flask. I’m sure you can understand the thought progression [from ‘crying, screaming, cake-smeared child’ to ‘clandestine alcohol consumption’], so I won’t bore you with the obvious. Kept in its original box when not in use. 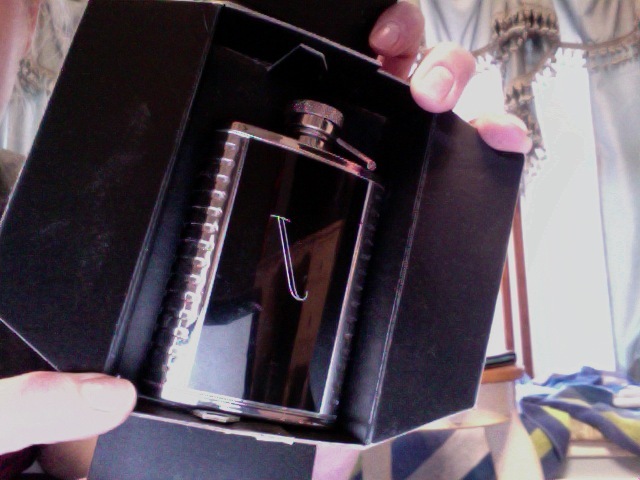 As you can see, it’s a first-rate flask, its single flaw being that it is much too small. It was given to me by perhaps the only person in this world who really gets me, the lovely woman who for three years I was fortunate enough to call my Work Wife (sadly, she has moved on to greener pastures, and I find I need the flask just that much more). I dedicate this post to her, and all the things we share in common (including, but not limited to, a deep understanding and appreciation of Michael Bublé lyrics and someecards.com). I’d like to say that that leads nicely into the #1 reason I need a flask: Work. But, I should be clear in that I’ve yet to find the nerve to bring a flask to work, and somehow just barely manage to make it through the front door each week day before letting my Grey Goose loose. No, remarkably, it’s not work. Your Showers (Baby or Bridal and dear god don’t tell me there’s any other kind). I don’t even know where to start, but I do know the rest of this post is going to write itself. If I have to play Bridal Bingo or see an infant clothesline one more time, I’m going Into the Wild. Women Lose. Their. Minds. at these things. The little prizes from the dollar store might as well be Robert Pattinson‘s used napkin. It’s like being in Oprah‘s audience, except the most any of us are going home with is a hydrangea-scented memo pad (and, in my case, a migraine). Don’t even get me started on those women who write recite a touching poem that no one can hear over the continuous cries of alleged Bingo, or the ones who are utterly convinced that they’re the first person in the world to think of melting chocolate in a diaper. And if you’re one of the women who encourages these other types (“Oh, Betsy, you are SO creative!”), you’re on my Poop List, too. The worst is when I’m put at a table full of strangers whose fanatical expressions remind me that there is absolutely no chance of finding a like-minded soul at this shindig, and also that I must be evil (and may in fact not even have a soul, despite my willingness to wear pastel and a convincing grin), because look at how much fun everyone else is genuinely having. My only saving grace is that I’m sitting close enough to the restroom to make a quick getaway (or seven). Bottoms up, you delusional tulle junkies. Games and poetry of any kind were banned from my bridal shower, but I still lose sleep at night thinking about how I put those nearest and dearest to me through this cursed ordeal. It is unforgivable, but at least we’re even now. My husband and I try to take our dog for a walk every day, which usually amounts to 3 times a week. The only option by our house is to do a full 2-mile loop, and some most times E.L. Fudge cookies in front of the T.V. wins. 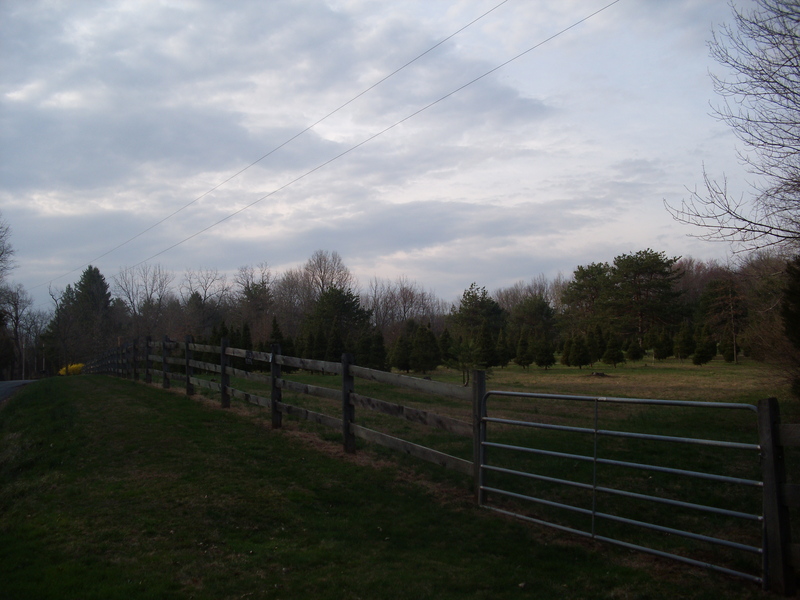 MILE 0.15: Here is where my dog decides to relieve himself. Every time. 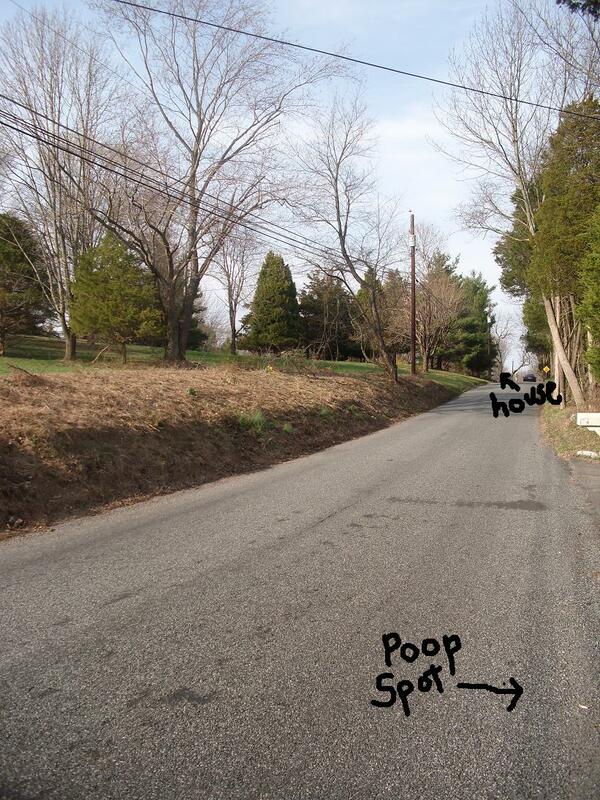 As if he KNOWS it’s just far enough away from the house to require me to carry his feces for the remaining 1.85 miles. 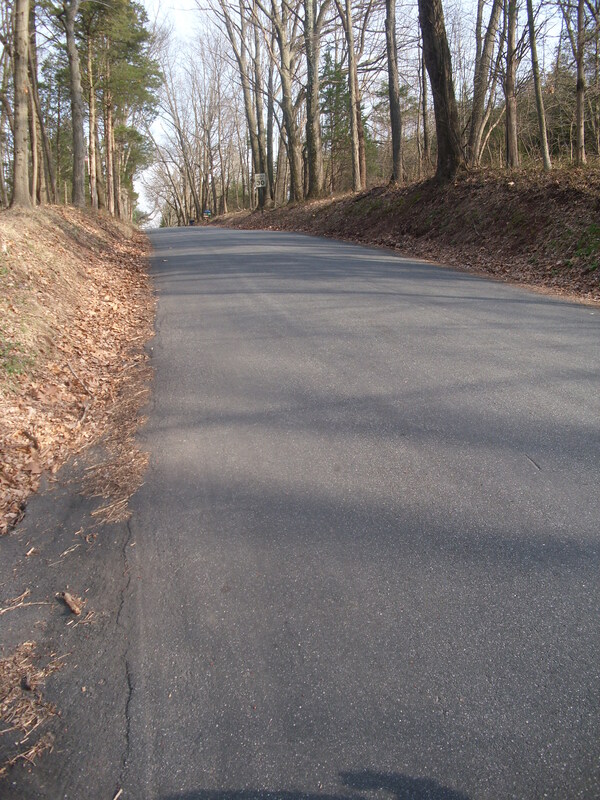 MILE 0.41: I cannot for the life of me fathom why climbing this hill mountain never gets easier. No matter how many vodka shots I turn down the night before. MILE 1.05: I don’t have a picture of Mile 1.05, because Mile 1.05 scares me, and I’m fairly certain that if I showed you why, you wouldn’t be able to sleep at night, and then I’d feel really bad (but would mostly worry that you’d stop reading my blog). Suffice it to say, the house at Mile 1.05 has a rusted sign on the gate, leading up to a dome-shaped apartment/garage, and it reads: HONK BEFORE YOU ENTER. 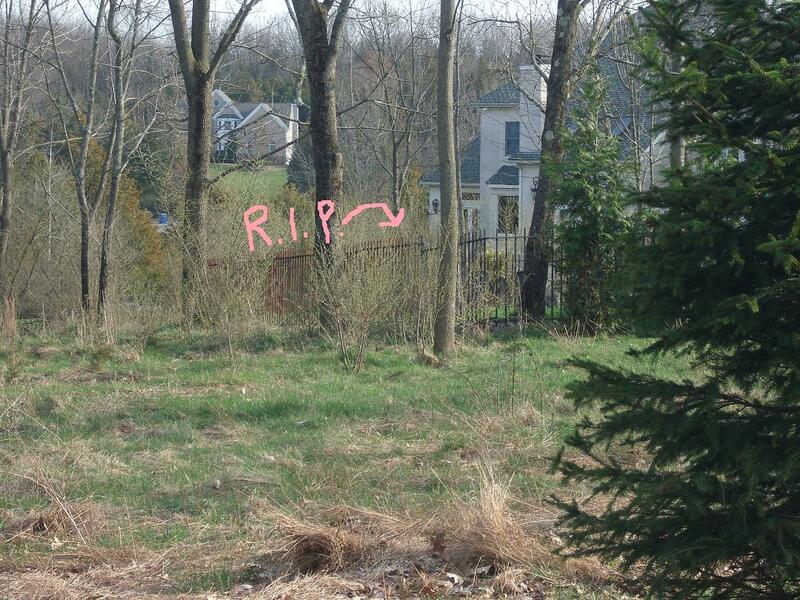 MILE 1.11: And if you’re not already freaked out, look what I recently discovered behind this seemingly-innocent house: a legitimate cemetary! They did a very good job disguising it; it took me almost 8 months to notice. But this worries me even more. I have so many questions, the first being, as I’m sure you’d imagine, are those people or pets? …And this is why I need to stop asking questions. MILE 1.18: Luckily, it’s not long before we land in Pleasantville, but this too perplexes me. 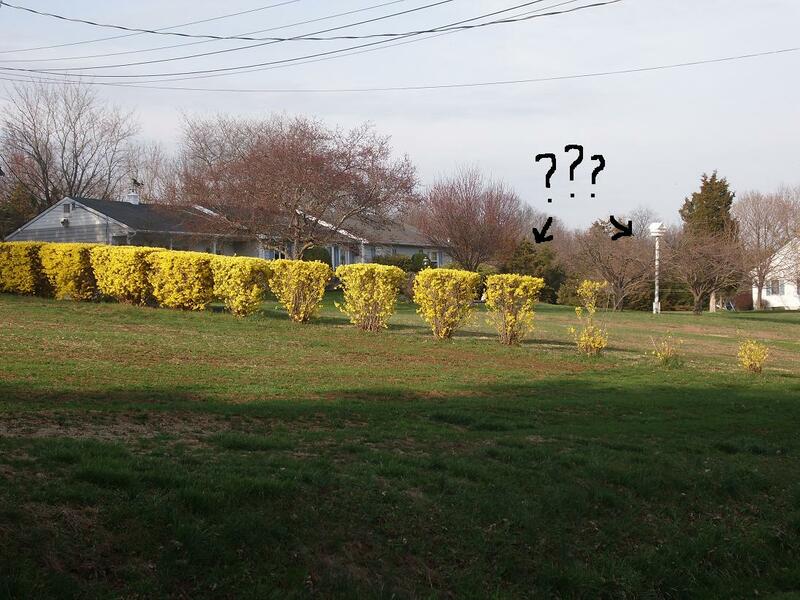 Are forsythia bushes supposed to look like that, and have the rest of us been offending Mother Nature unwittingly? And, P.S., what kind of birds are landing at this residence? I didn’t think turkeys could fly that high. MILE 1.30: Now not only am I in Pleasantville, but it is 1952 and the neighborhood kids have gone for a dip in the watering hole. 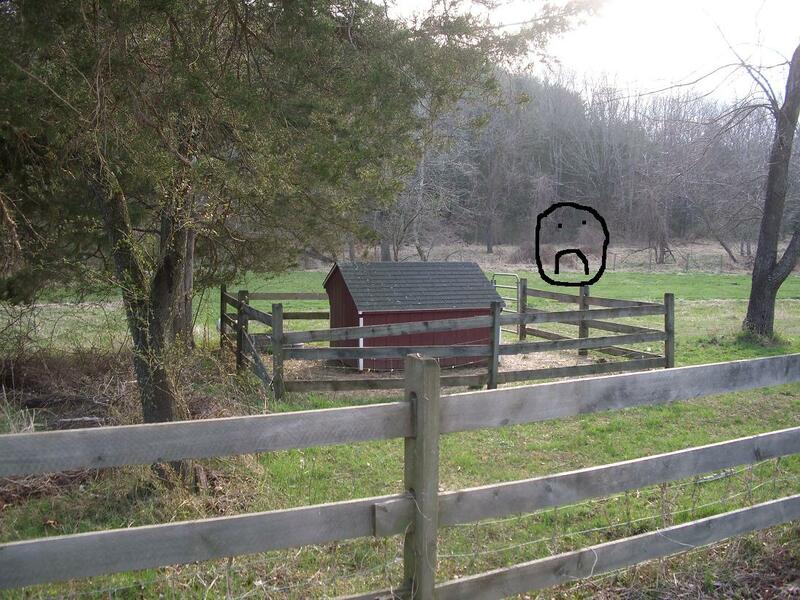 MILE 1.52: I have not yet figured out why these people have a miniature pony, nor why I feel so disappointed when it chooses to hide in its shack (in case you don’t already know, I could do without horses). MILE 1.60: There were 3 sheep here before winter. It’s spring now. Where are they? Oh, god, don’t tell me they’re behind the house at Mile 1.11. 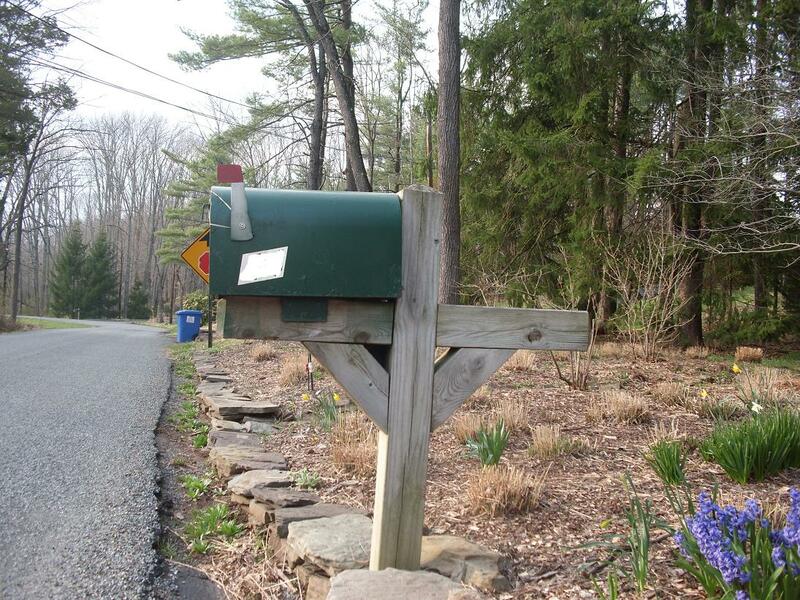 MILE 1.79: You might not be able to tell from this photo, but this mailbox’s general girth puzzles me. Just look at the massive posts holding it up. Do they often get large packages containing the parts needed to assemble Dolly Parton’s bra, or a shopping mall? Or do they have a very small-but-unhygenic houseguest who comes to visit frequently enough that it requires drastic sleeping arrangements? 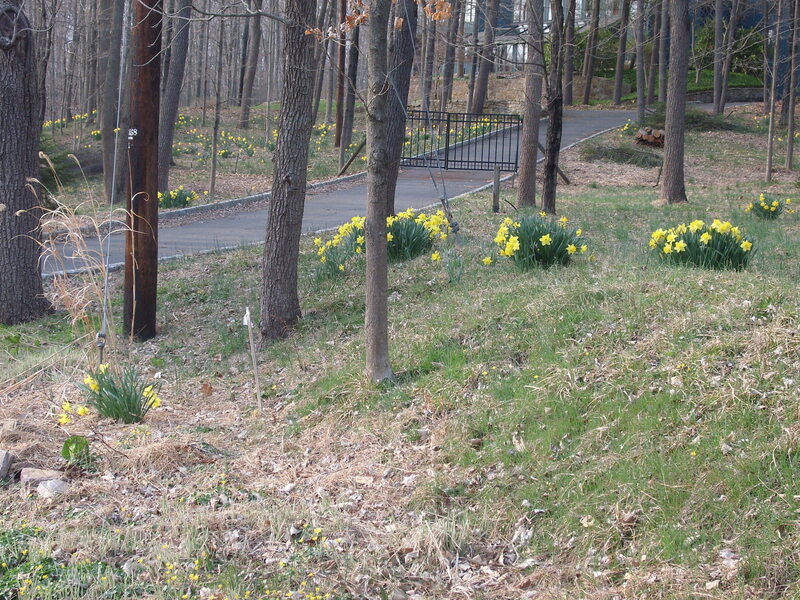 MILE 1.90: Daffodils. They’re everywhere! Why? 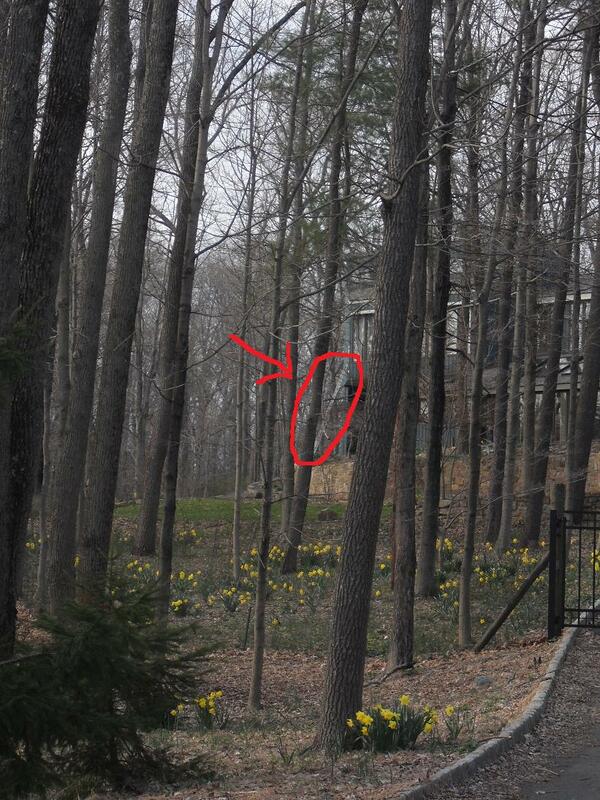 MILE 1.91: I will never, EVER understand why this house always has a ladder resting against it. Not always in the same place, but always there. 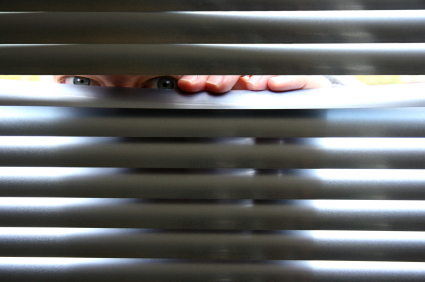 If someone is trying to sneak out (or in), they’re not being very sneaky, or consistent. And if repairs are underway, why am I not seeing any progress? That ladder HAS to be messing with their Feng Shui. These are all things I don’t understand. What I do understand is that if <insert deity here> wanted me to walk 2 miles every day, he wouldn’t have made Fudge Stripes taste so good. Wait, wait, P.S. – a little shout-out to someone else who’s confused: click here.